If you follow me on social media, you're well aware that I've recently found a new obsession with Soul Cycle, the re-invented indoor cycling class that believes fitness can be joyful. Well, I'm here to tell you that their mission of "Take your journey. Change your body. Find your SOUL" is a 100% fact. After being convinced to take a class at the NYC NoHo studio back in February during NYFW, I found myself going from 0 to 100 realll quick (thanks, Drake). As someone who use to wear her lululemon pants to watch Real Housewives of Beverly Hills on the couch with a pint of ice cream, to now taking 1-2 Soul Cycle classes per day, there is no doubt that this has been a successful journey - with the perks of whipping my body into great shape - and finding my soul that has been hiding under an uncertain, and at times, insecure, shadow for the past couple of years. In order to share my new found love for SC, on Wednesday night I hosted a group ride for some of my best friends, new rider friends who I've met through Soul, and UrbanBound co-workers. The class was taught by one of my favorite instructors, Kellen Townsend, so after the ride I sat down with him to get the low down on his recommendations for new riders, what he's learned on HIS journey, and how he found his soul. Interested in trying a Soul Cycle class? Create an account here and sign up for a class, any day of the week or time, that works best for you! Interested in trying a class with Kellen? Check out his schedule here and I'll see you there! 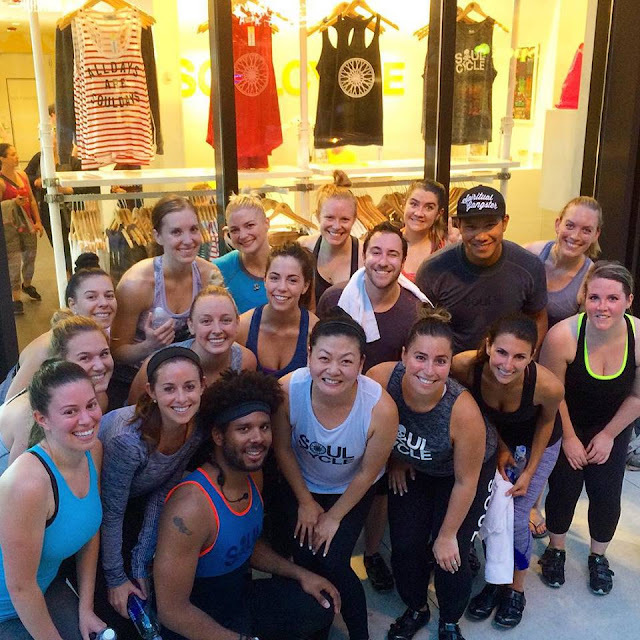 adoptedSTYLE: When did you take your first SoulCycle class? Kellen Townsend: I took my first SoulCycle class in March of 2013, while on vacation in LA. I made the mistake of not checking it out until the day I was flying back home to Kansas City. I must have blacked out at some point in between tap backs, because by the end of class I could barely recall what happened, but I knew was in love with it and that I had found my calling. It was over a year and a half before I would clip back into another SoulCycle bike in September 2014 while on a 24-hour trip to DC. AS: Why did you decide to become an instructor? KT: I’ve worked in the fitness industry in many different facets since college and have always wanted to be a fitness instructor, but was having trouble connecting with a workout that spoke to my “soul”. That changed immediately after I took my first SoulCycle class. Since I was living in a city that did not have SoulCycle, I wasn’t sure how it would happen. I am a firm believer in creating and believing in your own possibility. Back in the spring of 2013 I wrote in my goals “I am a SoulCycle instructor by 2015.” Shortly after moving to Chicago in the summer of 2014, I heard a rumor that SoulCycle would be opening in the next year and I began telling anyone who would listen about my goal! AS: What can you share about the training program every SoulCycle Instructor applicant has to achieve in NYC? KT: I will say that it was one of the most fun experiences of my life. AS: What are your top 3 favorite songs to play during your class & why? KT: 1. “Addicted to a Memory” by Zedd. The build in that song is unreal and the runs out of the saddle make me want to crowd surf my class! 2. Anything Beyoncé, because Beyoncé. 3. Anything Rachet. I have a not-so-secret love of ratchet hip-hop beats and I love mixing it into a playlist with my love of pop music. It’s always fun to watch the reactions from riders when we go from Britney Spears to say... Fetty Wap. AS: What advice would you give a first time rider prior to coming to your class? KT: I’d always recommend going into class with an open mind and willingness to work hard! Of course, you’ll also want to arrive 20 minutes early to get comfortable in the studio and make sure you’re properly set-up by our trained staff or instructors! AS: What advice would you give to those that might be afraid to come try a class? KT: I’d tell them to do one thing a day that scares them. AS: What do you do when you’re not at SoulCycle? KT: I eat a lot of food and really enjoy cooking healthy meals. I also have a love for dogs, so I am in the process of building my own dog-walking/sitting business with a friend. And since this is my first full summer in Chicago, I am working on exploring new neighborhoods, restaurants, festivals and attractions around town. I just checked out the Lincoln Park Zoo this week! I am also working on building my own lifestyle blog (Instagram/Twitter: @homosweatual + www.homosweatual.com). AS: What has been your favorite thing to do thus far while in Chicago? KT: EAT! I love trying different restaurants throughout the city. I have a list of restaurants in the notes app on my phone that I would like to try out this summer. Most of them I’ve either heard about through word of mouth, have walked by and/or read about. This week I tried a new spot in my neighborhood (Lakeview), Glaze Teriyaki. It was delicious!!! For those of you who don't know (and shame on you!) Simply Stylist is back and coming to Chicago THIS WEEKEND on Saturday, July 18th from 10am-5pm at The Dana Hotel & Spa. This fashion & beauty conference is, by far, one of the best I've attended. The conference is hosted by the lovely, Catt Sadler, of E! News - plus many other influential tastemakers from all over the country from the fashion, beauty, and entrepreneurial world. Want a chance to meet them? Or even sit in on a breakout session to learn about their journey? Make sure to snag your tickets today as some package are already sold out! Just to tide you over until this weekend, here are some photos from last year's event, as well as a sneak peek at this weekend's itinerary. We'll be chatting it up with Catt again (and this time on VIDEO) so make sure to check back to watch our catch up session with one of the most stunning and talented women in the industry. Whether you’re coming with a friend or on your own, we encourage you to grab a seat next to a stranger, put your networking skills to use and build a relationship that could potentially change your life forever! We have 5 inspiring speakers from the fashion & beauty industry. Learn what it takes, how to succeed, the importance of networking and how to follow your dream – all from the experts! DJ, Cocktails, Appetizers, Shopping, Pampering, Contests & 5 Breakout Sessions on various topics from industry tastemakers. What more could you ask for?! There will be free shuttles that run from 12pm-11pm with pick ups from the Cermak-Chinatown Red Line & the Cermak-McCormick Green Line. It may also be a great idea to try out divvy and bike to the festival; at least one way. What to bring: Sunscreen, a phone charger, a light purse/back pack that you won't regret lugging around all day in the sun, comfortable flip flops, hand sanitizer/wipes. Want even MORE Mamby? 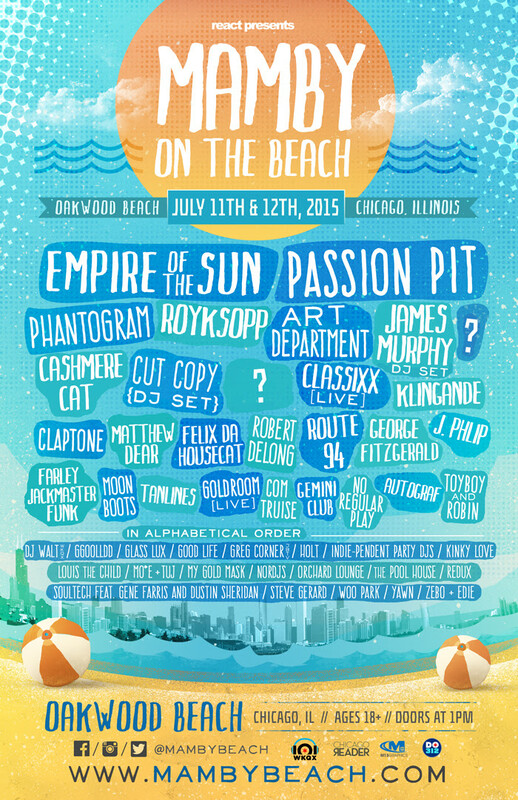 Check out the after party line up here & see you at Dusable Harbor for the Goldroom yacht party! 3-hours of open bar? YES, PLEASE!